Brandon Lee was killed by a bullet accidentally lodged in the barrel of a revolver that was subsequently propelled from the barrel by a blank cartridge. Even a primer, without a propellant charge, is enough to lodge a bullet in the barrel. A blank charge equivalent to a ‘full charge’ movie blank will successfully propel that bullet from the barrel with lethal velocity. OK, that’s the short version for the casually interested and the hard-of-thinking. Here’s the full story. A few months ago I took part, along with a forensic scientist colleague, in tests and interviews for a documentary series on the subject of conspiracy theories. This aired last night in the UK as part of episode 5 of Channel 5’s series ‘Conspiracy’. The subject was the tragic death of Brandon Lee, killed by a shot from a Smith & Wesson 44 Magnum revolver* on 31 March, 1993. 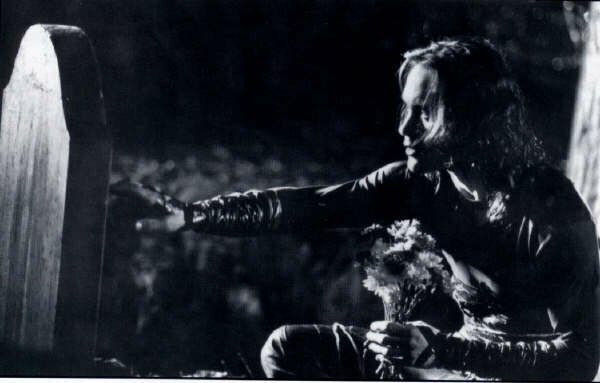 I was, and remain, a very big fan of The Crow, and by extension of Lee, who made the role his own with tremendous presence, emotion, aggression, and physical ability. I have as much reason as anyone therefore to cry ‘coverup’. If I felt that the star of perhaps my favourite film had been murdered or negligently killed, I would be, as they say ‘all over it’. But in reality, I am convinced, as a firearms specialist, and knowing the impact that this incident had on best practice in the movie industry, that Lee’s death was a somewhat improbable accident that seems less improbable the more you learn about it. I took part on the understanding that the programme would not be endorsing the conspiracy theories themselves. Channel 5 did us proud. The format of the series does allow the theorists roughly equal airtime, allowing the viewer to come to their own conclusions. As ever, that means conspiracy fans can come away with their ideas intact, or even enhanced by new nonsense, and sceptics will spot the BS right away. Whether members of the casual audience might end up falling for a given conspiracy theory, I can’t say, and it’s the risk of taking part in this sort of television. I felt, however, that it was important to get the ‘official story’ out there, as the subject I’d been asked about is one for which the ‘signal to noise ratio’ is pretty skewed in favour of at least a cover-up, if not outright conspiracy. And in the case of the Brandon Lee segment, I think it would be hard for any rational viewer to come away believing the Triad conspiracy. Unlike most of the other participants, we were up against some conspiracist who chose to remain anonymous due to fears of reprisals by the Triads that he believes killed both Bruce and Brandon Lee. No evidence was offered for this at all, save that Bruce Lee was Chinese and allegedly refused to pay protection (or whatever) to the Triads – and that Brandon was his son. That was it. Quite who this shadowy figure was, I have no idea. ‘In the scene in which Lee was accidentally shot, Lee’s character walks into his apartment and discovers his fiancée being beaten and raped by thugs. Actor Michael Massee’s character fires a .44 Magnum revolver at Lee as he walks into the room. A previous scene using the same gun had called for inert dummy cartridges fitted with bullets (but no powder or percussion primer) to be loaded in the revolver for a close-up scene; for film scenes which utilize a revolver (where the bullets are visible from the front) and do not require the gun to actually be fired, dummy cartridges provide the realistic appearance of actual rounds. Instead of purchasing commercial dummy cartridges, the film’s prop crew created their own by pulling the bullets from live rounds, dumping the powder charge then reinserting the bullets. However, they unknowingly or unintentionally left the live percussion primer in place at the rear of the cartridge. At some point during filming the revolver was apparently discharged with one of these improperly-deactivated cartridges in the chamber, setting off the primer with enough force to drive the bullet partway into the barrel, where it became stuck (a condition known as a squib load). The prop crew either failed to notice this or failed to recognize the significance of this issue. Dummy cartridges made from live by second unit, one round left with primer unfired. Revolver not properly cleared/cleaned, stored for two weeks. Same weapon provided to first unit for the Eric Draven death scene. Blank cartridge (full load) fired behind the lodged bullet, propelling it with lethal force. In fact, the only book to be published on the making of the movie, written by journalist Bridget Baiss, tells a slightly different story, one that is supported by the only other TV treatment of the case, ‘Unsolved Mysteries’ (series eight, episode 1, broadcast 20 Oct 1995 – see YouTube). This short segment features interviews with the Wilmington Police Department detectives who actually investigated the shooting. Note that the narration implies that only a primer remained, but if you pay attention only to what the detectives say, it matches Baiss’s account exactly. This shouldn’t be a surprise, as Baiss also interviewed both men. All other versions are hearsay. BLANK cartridges (¼ load) made from live by second unit (by pulling bullet, emptying propellant, and adding black powder and some form of wadding). DUMMY cartridges later made from the same blanks (by firing them & inserting a bullet into the now-empty case). One cartridge accidentally left unfired, but a bullet was inserted bullet anyway, creating a low-powered, live round. Note that although this version of events may seem even less plausible on the face of it, it does have the advantage of negating the main point of contention regarding the official story. That being the possibility of a primer alone being sufficient to propel the bullet far enough into a revolver barrel for it to a) not block the cylinder from revolving and b) not be noticed by crewmembers. In this version, this factor becomes irrelevant. This was the version that we chose to replicate in our testing. Note that the type of blank cartridge is irrelevant. We made our own, but factory-made blanks may have been used. Provided the case is properly wadded, and a propellant charge equivalent to (or frankly, even less than) a ‘full charge’ movie blank is used, the bullet will be driven from the barrel. However, as already stated, it IS perfectly possible for a primer (especially a magnum primer) to do this, making even the popular version of the story still plausible. I know, because I’ve tried it, multiple times. There is enough variance in the manufacture of primers and bullets, for a bullet to lodge partway out of the chamber, or all the way out of it. Our first attempt lodged the bullet clear of the cylinder, but only a centimetre or so down the barrel, making it visible to anyone observing normal safety precautions. However, it is clear that not everyone on set was observing them, so this sequence of events remains at least plausible. A blank charge equivalent to a ‘full charge’ movie blank will successful propel that bullet from the barrel. A bullet fired in this way retains more than enough velocity to fully penetrate a 10% ordnance gelatin block approximately 12″ deep. Thus either version of the story, or some other variation of it, could have resulted in the death of Brandon Lee. No conspiracy theory is required, nor is there any evidence to support one. It was an emotional experience taking part in this filming. When our ‘dummy’ bullet popped into the barrel, I began to feel a little odd. When, shortly afterward, the blank blasted the bullet from the barrel and through the ballistic gel in front of me as though it wasn’t there, I had to suppress a tear at the thought of what happened that day. I had wondered what we’d do if, as many have claimed, this wasn’t actually possible. There would be no question of faking anything. Nor could I really have withdrawn from filming by that point. We would have been obliged to state that we thought it was possible, but no, we couldn’t recreate it for the cameras. As it was, Channel 5 got multiple successful shots. Was it flawless? No. Out of six attempts, two failed as a result of the small propellant charge lodging the bullet too far into the barrel. When trying just the primer, out of several attempts, one did block the cylinder. To me, this doesn’t make the official story any less plausible; but it does make it all the more a tragic roll of the dice. The proverbial ‘golden BB’. You could follow the same series of mistakes, and still narrowly avoid killing Lee (especially when the revolver being pointed at him, against best practice, is factored in). There’s one silver lining to Brandon’s death. It’s used as a cautionary tale across the fields of cinema and of firearms. It’s impossible to quantify, but in death, he will have saved countless lives. *Gun nerdery alert. I believe the revolver used was not, as is usually claimed, a Model 629 (stainless steel), but a Model 29 in nickel plated finish with 6” ‘pinned’ barrel and recessed chambers. This is what we used in the documentary. However, movie lighting and the level of polish on the screen-used prop make the two impossible to distinguish for certain. Note that, in yet another layer of misfortune, the original movie script called for an AMT Automag – a semi-automatic pistol for which there would have been no need to make dummy rounds (they would not be visible unlike in a revolver’s open cylinder) and therefore, no accident. This is Baiss’s book, originally published in 2000. Recommended reading for any Crow or Lee fan. You may be able to read the section on Lee’s death as part of the Google Books preview here.